Dylan Thomas wins the penultimate round, reclaims the Championship lead, and sets up a title decider in October. Report: Zak Caban | Photos: Zane Al-Said, Chris Gough, Steve Mison and Shelly Ives. 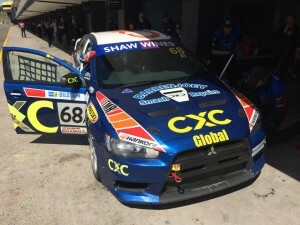 CXC Global Racing’s Dylan Thomas was again the man to beat in the Shaw Vineyards NSW Production Touring Car Championship. After a disappointing Saturday sprint race, caused by a deflated tyre, Thomas bounced back to win Sunday’s one-hour enduro by over 45 seconds. Dramas for the BMW M3 of Anthony Soole and Glenn Townsend’s entry yesterday meant they would not start the race, and therefore we were left with 29 starters for the penultimate round of the Championship! The morning started with a stern word from the category’s Driving Standards Observer, Russell Norden, who was less than impressed with the argy-bargy in Saturday’s two sprint races. Norden was quick to remind drivers that Sunday’s race was an hour in length, and wouldn’t be won in turns one and two. Daniel Oosthuizen’s car would not start this race, but Daniel still would, as Roelof Oosthuizen, who was due to run with his other son Jack, stepped aside, allowing the brothers to team up for the first time in the Shaw Vineyards NSW Production Touring Car Championship, starting from 17th position. 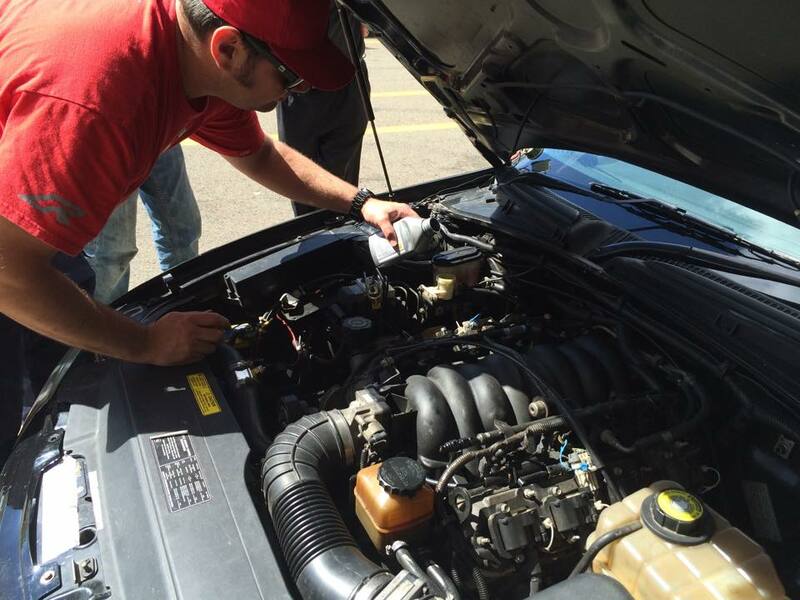 Daniel’s car suffered an engine failure on Saturday afternoon, when the tip of the spark plug went through the cylinder, and melted the fourth piston. It was important that Daniel still compete in this round, given his position in the championship. Robert Coulthard’s day didn’t start so well – he was forced to start from pit-lane, as he was changing some steering settings, and failed to make the holding area before the cars were released onto the circuit. Thankfully, he did make it to the end of pit-lane before the race started, and therefore was allowed to join the contest after the entire field had passed the pit-lane exit. Thomas had to wait until the compulsory pit-stop cycle to inherit a comfortable lead, after spending the first thirty minutes of the race chopping and changing with Luke Searle for the race lead. Searle led away from the start, and battled with Thomas right through until the CXC car entered pit-lane for the compulsory pit-stop… it was during that pit-stop period where the race was won and lost. Thomas’ stop was brilliant. 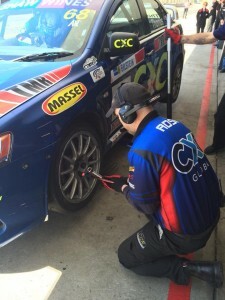 He would later praise his team on social media, saying “I have the best crew on my cars”. He pitted before Searle, in what we normally describe as the “under-cut” strategy, and managed to find himself in the lead of the race once Searle completed his stop, and handed over to Barry Graham for the run home. Searle and Graham’s pit-stop was slow however, and as a result of that, Thomas would lead by over half a minute once Graham rejoined the circuit. 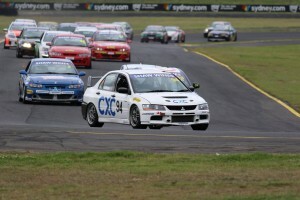 From there, the Sydney-sider for CXC Global Racing only had to keep it on track to ensure victory, and he would cruise to the Chequered Flag, whilst extending the margin if you don’t mind. There was a lot of drama in the one-hour, as there always is, and it started with the Class B2 entry of Dean Potts and Gordon Wilson. Wilson started the car, and unfortunately their race ended after only 3 laps, when the bonnet came loose on their car in the early stages, which resulted in it blowing off the car, and smashing straight into the windscreen, shattering said windscreen in the process. The car returned to pit-lane, and was parked in the garage, with no hope of returning to the circuit, and they were the first retirement after only six minutes of racing. Soon after, Steve Hodges car was in trouble, and also found itself in a pit garage. Fluid was leaking from the vehicle. The car would return to the circuit soon after, but with the problem recurring, the Commodore was forced back into pit-lane, and this time, into retirement. 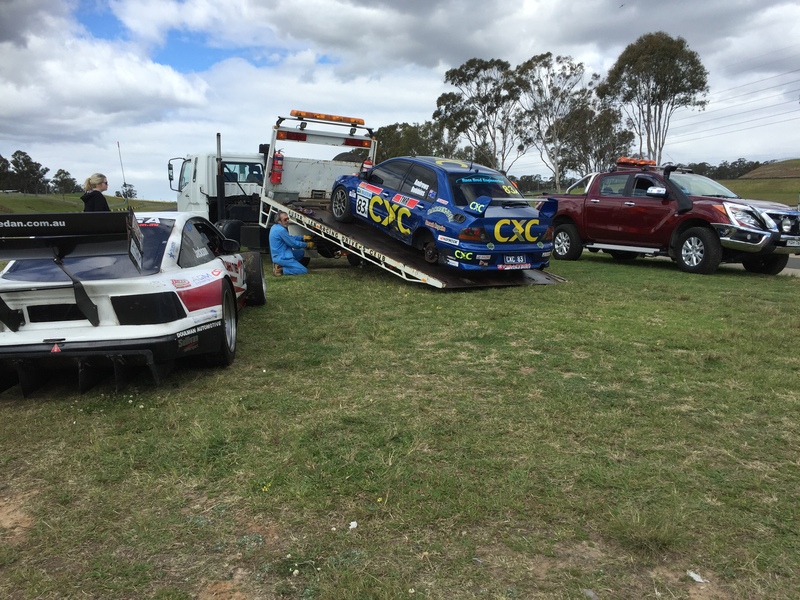 The second CXC Racing entry of Jacob Andrews and Gus Robbins unfortunately didn’t enjoy the success of their team-mate Dylan Thomas. The #83 pulled up on the right-hand side of pit-straight, and it went no further, after the left-rear parted company with the vehicle. Thankfully the incident didn’t trigger a Safety Car – Officials deemed that the parked car wasn’t in a dangerous position, and allowed the field to continue running under green flag conditions. 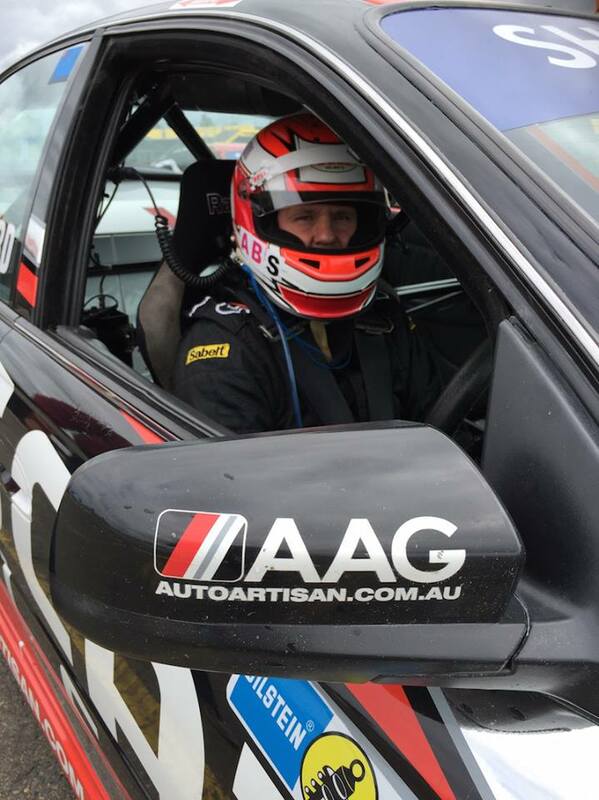 Robbins didn’t get to drive the car in the enduro, and poor Jacob Andrews is in the early days of his tin-top career, and missed out on some valuable time behind the wheel, as he prepares for the Winton 300, as a result of this retirement. All that drama occured before the compulsory pit window opened. There were two big movers in the enduro, namely Robert Coulthard, and the Oosthuizen entry. One followed the other through the field in the early stages, but it was the Oosthuizen entry that finished stronger. Jack pitted from 10th, handed the car over to Daniel for the run home, and he managed to make it onto the outright podium, albeit as a result of the penalty handed down for the McKinlay/Heeley entry, but nevertheless, it was another outstanding driver from the older of Roelof’s sons, and made more impressive by virtue of the fact that he was driving Jack’s car, and not his usual Championship vehicle. Robert Coulthard was due to start 17th, but started from pit-lane as we mentioned earlier, and blitzed his way to be 7th in the pack when he pitted for his compulsory stop. He would rejoin in 15th, before making his way through to be 10th when the chequered flag was waved. 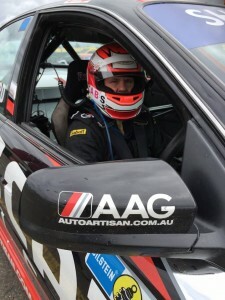 Around the time the pit window was closing, the HSV Clubsport entry of Mark Caine and former Nissan GT Academy star, Joshua Muggleton was in pit-lane for an unscheduled stop. The car was taken into the garage with a reported clutch and hydraulic issue. The team had a quick look at it, and sent Muggleton back out to see if the problem had been rectified, but unfortunately the car would return to pit-lane a short time later, and that’s where it stayed, with Muggleton and Caine retiring from the race. Anton Mechtler and Jason Walsh also retired from the race during that period. A fuel issue was the problem for the #38 car. It was driven straight into the garage on its first unscheduled run down pit-lane, and didn’t return to the circuit. The Renault Migane was the last car to report to pit-lane during the race, and it too was in there to retire sadly. The car, driven by Kyle and Blake Aubin failed to finish due to a power issue. At the end of the day though, Dylan Thomas came home to take the chequered flag – winning what was essentially a Sunday afternoon cruise for him in the end, defeating Searle and Graham by a margin of 45.54 seconds. Graham was the slower of the two drivers in the BMW, and when they lost 31 seconds to Thomas in the pit-stop cycle, it was always going to be hard to take the win from there. Thomas gradually bridged the gap to 45 seconds, while Searle and Graham consolidated. The #62 did however, set the fastest lap of the race. 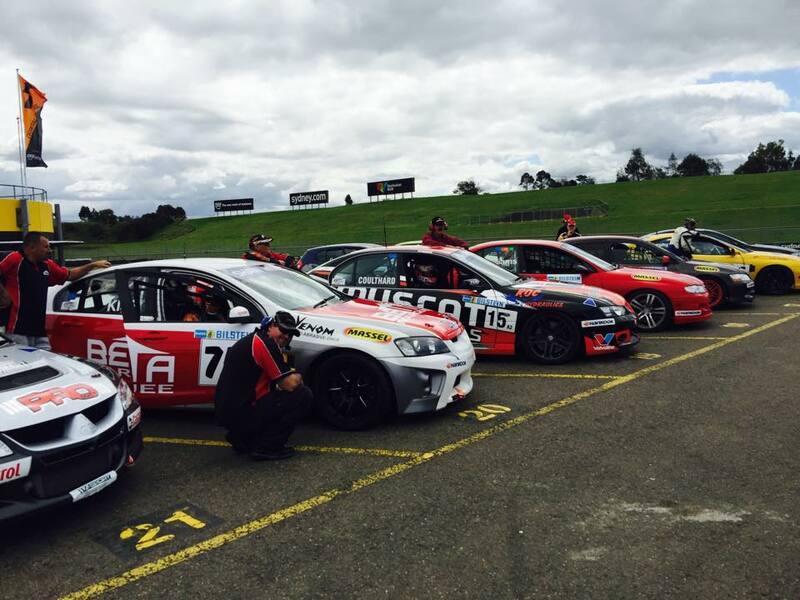 Luke Searle clocked a 1:44.0111 on Lap 3 of, what turned out to be, a Safety Car free 34-lap race. Our winner completed 34 laps of the 3.93km Sydney Motorsport Park circuit, which equates to 133.62km. Third place, both outright and in Class A1 went to Daniel and Jacques Oosthuizen, who started 20th. A remarkable drive through the field, from two of the category’s talented youngsters. Thomas was the outright and Class A1 winner, but elsewhere there were some great battles to determine our other class winners as well. Overall, there were 20 finishes from 28 starters, so just over a quarter of the field retired from the race, which is a high attrition rate for a race of only 60 minutes in length, and it’s important to note that those retirements were all due to mechanical issues, rather than racing incidents, as we detailed above. Class A1 locked out the first three positions on the outright podium. Class A2 went to the Holden HSV GTS of Jamie McKinlay and Brett Heeley, who gradually eased away from Tony Virag and Graeme Muir as the race progressed. The latter two took 5th and 6th outright, and 2nd and 3rd in class respectively. 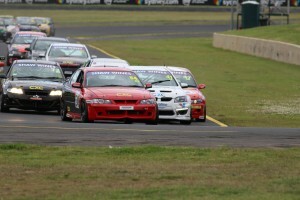 In the qualifying races on Saturday, the man at the helm of this series, Gerry Murphy was right in the thick of the action, and was left repairing some dints in the bodywork of his yellow Holden Monaro, but his enduro was rather uneventful, and he and Michael Caine would manage ninth outright, and sixth in class A2. Muir was very lucky to take third in class, after only just beating Trevor Symonds and Paul Lane in a photo finish. Just 0.16 separated the pair when they crossed the line after 33 laps. Peter Lown and Paul Loiacono claimed victory in Class B1, while Geoff Kite was victorious in Class B2. Simon and James O’Donnell from GWS Motorsport were the winners in Class C, and what a terrific achievement that was for the two boys, in this, their debut race in the Shaw Vineyards NSW Production Touring Car Championship. 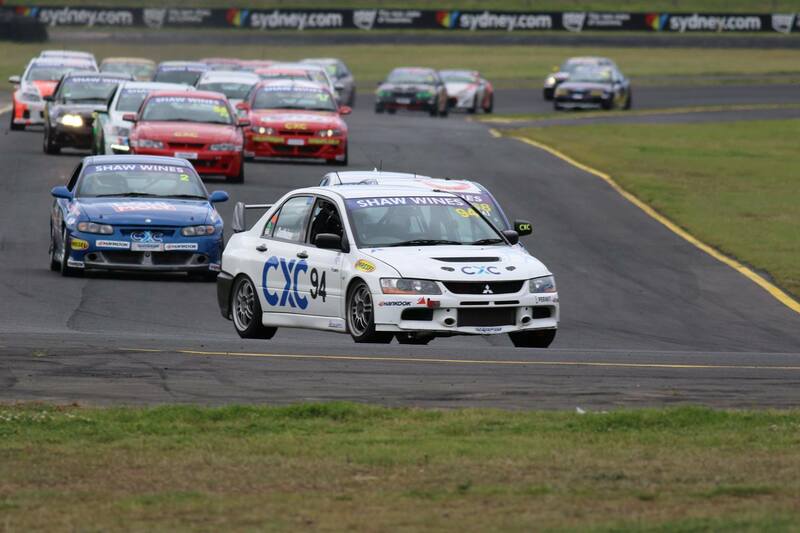 Chris Reeves kept his title hopes alive by finishing the race as the leading Class D car, and he’s still a chance to win the Championship outright when we come back to Sydney Motorsport in just under four weeks time. With Sunday’s race victory, Dylan Thomas also secured the MoComm Endurance Cup for 2015, and with threes from four one-hour races this season, he was a comfortable, convincing winner in the end. I mentioned earlier that the DSO wasn’t thrilled with some of the driving standards displayed on Saturday, but when I spoke to Russell Norden post-race on Sunday, he was very pleased with the overall standard shown from all drivers, noting that they took on board what he said earlier about the race not being won in the first few corners. He also hinted that his job may not be so easy at the final round of the series next month, as a result of it being the final outing for 2015, therefore drivers will be fighting right to the end to secure as many points as possible, in a bid to improve their final position in the championship, and there’ll also be a few drivers with some scores to settle ahead of the summer break you would assume. Add in that the format is three sprint races, and there’s plenty to look forward to then. Unfortunately though, in this round of the series, no less than five cars received post-race penalties for infringements during the compulsory pit-stop window, and had time added to their race time, which did have an impact on the outright finishing positions. 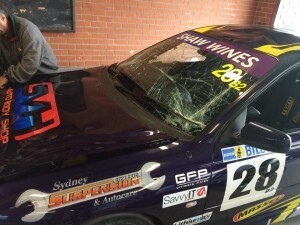 The entries of Simon and James O’Donnell, and Jamie Hodgson were the hardest hit, copping 2 minute penalties. Brett Heeley and Jamie McKinlay were originally penalised 2 minutes and 5 seconds for a pit infringement, but Heeley appealed his case to the Stewards. The original issue was with the car controller for the #47, not either of the tyre changers or the driver assistant. Stewards later found that there was no issue with the fourth member of the pit-crew, and withdrew the time penalty! Tony Virag and Nigel Williams were both given five-second penalties, while Nandi Kiss received double that. Geoff Kite was the only other driver to be penalised, receiving a 30-second penalty for speeding in pit-lane during his compulsory pit-stop. All other penalties were for pit infringements, or for exceeding the track limits on the exit of the turn 8 hairpin, as there was no racing incidents to be reviewed by the Stewards. 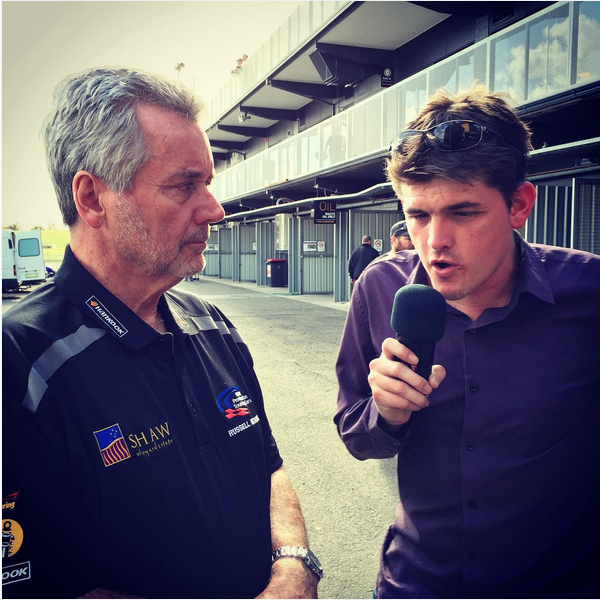 Interest in Shaw Vineyards NSW Production Touring Car Championship has never been better. This series will go right down to the wire, and the competition is very much alive and well. So, Thomas wins the Enduro season, but the Club and State titles are still very much up for grabs. 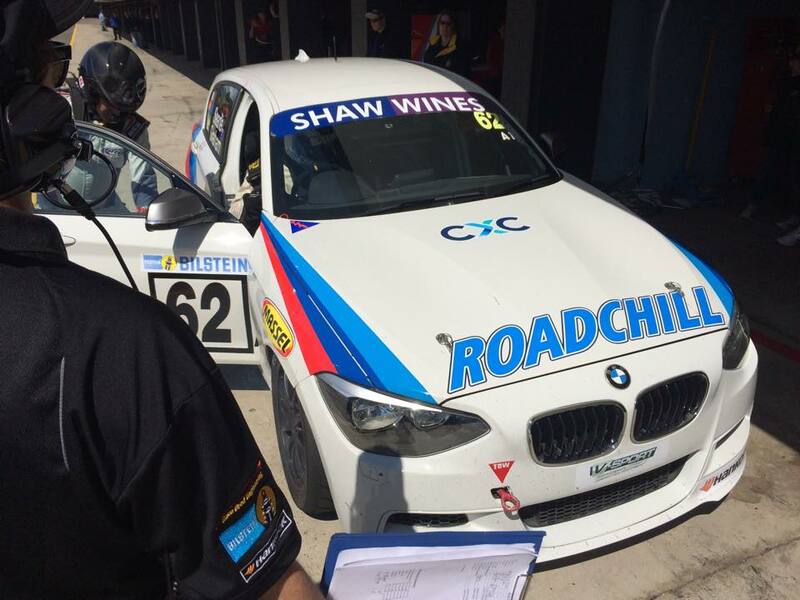 The next time the Shaw Vineyards NSW Production Touring Car Championship goes racing, those two titles will be decided. 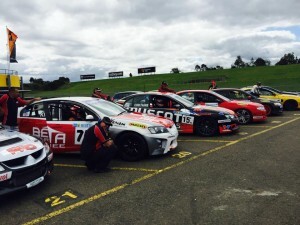 It will be the final round of the 2015 CAMS NSW State Motor Racing Championships, a sprint round, on October 24 and 25, with the final three races of the season to be held back here on the Gardner GP 3.93km layout of Sydney Motorsport Park. Until then, thanks for your company!